This week on The Flash, Caitlin tries to reconnect with her long-lost father as most of Team Flash try to figure out who the villain of the season really is and where that evil dagger of his came from. Much like last week’s episode, the show successfully manages to give a character other than Barry the spotlight for a bit — Iris before, Caitlin now. We get a lot more season plot balance in this episode versus last week’s more precisely focused episode, but still. It’s all cool. We’re continuing the Cisco and Caitlin C-Story from last week, except now it’s been graduated to the A-story. Congrats, guys! Half the team (Iris, Sherloque, and Nora) splits off to hunt down the dark matter-infused satellite core and Cicada answers and the other half (Caitlin, Cisco, and Barry) head to the North Pole, which some investigation work has identified as the last known location of Thomas Snow, Caitlin’s dad. Aww, Team Flash: Original Recipe is together for this episode! That’s nice. Once Barry phases himself and his friends through a wall, it takes no time at all for the three to stumble across Thomas. Thomas reveals that he already knows who everyone is because he’s had access to a one-way video feed into S.T.A.R. Labs for a while. Um. Creepy? He says it’s because he used to video chat with Harrison Wells (the real one?) but yeah, the idea of someone secretly watching everyone in the lab long enough to figure out who people are is really, really creepy. Strike one against Thomas! Thomas went to the lab in the first place in order to stop the progression of his ALS and, because he was dealing in kooky crazy science, he quarantined himself just in case things went awry. The good news is, he made progress with stopping the symptoms of ALS. The bad news is, the site he was working in was shut down. With him inside. By Caitlin’s mom. That sounds really harsh. Some might even call such behavior... cold. With his story shared, Thomas accompanies the three back to S.T.A.R. Labs. Cisco is not okay with this because he finds Thomas’s story super suspicious, even making a snarky reference to him creeper-watching the lab through that video feed. Valid, Cisco. Super valid. Also, Cisco being suspicious of Thomas? Strike two against him, although I don’t even know why I decided to start measuring strikes. It’s obvious just from the actor’s line delivery that Thomas is actually evil. While out on a walk with Caitlin, Thomas has some kind of attack and his arm goes all icy. Caitlin takes him back to the lab and, when he comes to, he explains that his attempt to cure his ALS led to something deadlier: a mutation that’s rewriting his genetic code, which will eventually kill him. Then Thomas admits that he found the genetic marker for ALS in Caitlin and, wanting to stop the disease before it ever manifested in his daughter, did some experimental cryogenic gene therapy on her that gave her the Killer Frost alternate personality. Cisco is understandably judgmental about this dude’s willingness to do scientific experiments on his own daughter. Seriously, Caitlin’s mom felt no qualms about locking her husband up in a black ops site and faking his death, and her dad performed experiments on her when she was a little girl. Frankly, it’s a miracle Caitlin has such a gentle personality, because her parents are nightmare people. 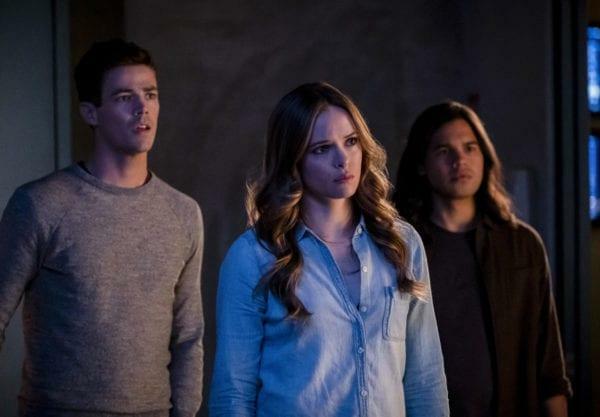 Caitlin, Barry, and Thomas devise a plan for stopping the deterioration of Thomas’s cells while Cisco protests against everything that’s happening so conveniently on Thomas’s behalf. Cisco recognizes that both Caitlin and Barry are letting their emotions get in the way of their rationality. Barry just sees the Snows finding each other again as a lovely reunion between father and daughter, like what Nora experienced when she traveled back in time to meet him, and Caitlin is so desperate to have a family member she can genuinely connect with that she’ll accept anything Thomas tells her. Even after Cisco uncovers holes in Thomas’s story, Caitlin takes her father’s side over her friend’s. Eventually, though, Caitlin’s scientific brain manages to work out the truth without the bias of familial love clouding it: Thomas’s cryogenic meta personality plotted everything just to manipulate Caitlin into making a serum that could permanently suppress his human side. When Barry, Caitlin, and Cisco confront him, he turns all frosty and knocks them out, then swipes the serum Caitlin developed. He still needs to apply the serum in sub-zero temperatures, though, so he heads to a DOD site to find a device that allows him to do so. Team Flash follows Thomas — now dubbed Icicle — to the site so they can stop him, but it’s too cold in there for regular humans to survive. Caitlin, who is apparently immune to the cold thanks to Killer Frost, is the only one left standing while everyone else freezes. And speaking of Killer Frost, desperation to prevent Icicle from destroying Thomas Snow forever causes Caitlin to manifest Killer Frost again. She’s able to fight off Icicle and destroy the serum but, after a brief moment in which Thomas seems to fight through the Icicle personality, he escapes in the end. The whole experience wasn’t a total loss, though, because when Caitlin returns to S.T.A.R. 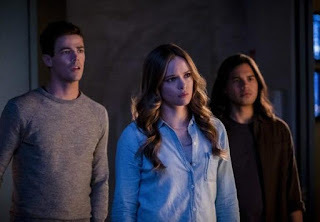 Labs, Cisco (inspired by the sudden reappearance of Killer Frost during the fight) provides a new explanation for how Killer Frost was lost in the first place: DeVoe hadn’t destroyed her, but instead locked her behind a mental block. Ostensibly, Caitlin would just have to access that part of her mind again, and Killer Frost would be back for good. He gives her Harry’s mental dampener from last season, which allows Caitlin to directly communicate with Killer Frost, so they can build up their relationship. Neat! Everyone who isn’t chilling with Caitlin in the A-story is on a quest to find more information about Cicada. Iris and Nora team up because after the whole jumping-off-a-building thing, Nora now sees her mother as the coolest human on the planet (and it’s adorable even when it’s awkward). Oh, and Sherloque is there too. Their job is to hunt down the actual satellite core, from which Cicada’s dagger likely originated. In an endearingly odd pairing, this leaves Ralph with Cecile to track down the names of people who might have been treated by FEMA after the Enlightenment crisis. Iris and Nora figure out that the core might have fallen into the water, and Iris talks Nora through a technique she used when she was briefly a speedster. It’s a real mother/daughter bonding moment, but not quite enough to end all the awkwardness between them. They do manage to pull up the satellite core, though, and bring it to S.T.A.R. Labs just in time for Ralph and Cecile to arrive with a name that could possibly belong to Cicada’s daughter, making Team Flash one step closer to the villain’s identity. We do get some scenes with Cicada himself, and he’s developed a horrible case of Batman Voice I don’t remember being so annoying in previous episodes. Also, the doctor who keeps helping him out is getting more and more intriguing. So Cecile is a straight-up metahuman empath now? I can never tell if the show wants her abilities to be permanent or not. I do appreciate the Deanna Troi Star Trek reference, though. Holy crap do I love Iris and Nora’s awkward handshake at the end of the episode. It’s beautifully inept. Kudos. “Ralph Made Me Laugh, What Is Happening” count of the episode: at least two. First, when Ralph authoritatively held up his wallet, sans any form of ID, when meeting with the FEMA field director guy. Second, when he swept everything off the guy’s desk while leaving, just to be petty.